Christmas wishlist – adult fiction – and a giveaway! In case you’re already hanging out for some summer holiday reading bliss or you need to buy Christmas books for friends and family, here’s a list of my favourite adult books I’ve read this year. The links lead you to a longer review that I wrote earlier in the year. And there’s a book giveaway, too, to say thank you to all of my wonderful blog readers, who leave comments, share their book recommendations, support my workshops and encourage my writing! The book is Storyland by Catherine McKinnon – there’s a review below. If you’d like the chance to win this fabulous book, leave me a book recommendation in the comments below. The winner will be drawn on Thursday 22nd November, and I will contact the lucky winner to organise delivery of their book. Bookshop of the broken-hearted by Robert Hillman – It’s 1969. Tom Hope is a Victorian farmer in his early thirties – quiet and stoic. He’s the sort of man who has to practise smiling because he doesn’t do it very often. Hannah Babel is a Jewish woman in her mid-forties from Budapest who lost her husband and small son at Auschwitz in World War II. She’s vivid and eccentric and she wants to open a bookshop in the small town of Hometown. Tom’s wife, Trudy, left him – twice. But she only came back once. Hannah is a widow two times over. Can they make their relationship work? I devoured this book – you can read more here. The helpline by Katherine Colette – the protagonist in this debut novel, Germaine, made me laugh and cringe – often at the same time. Germaine is a character along the lines of socially-awkward Eleanor Oliphant (see review below) and Professor Don Tillman of The Rosie Project. Germaine is forced to look for another job and when she can’t find one at her competence level, accepts a role at a council, answering calls for a senior citizens’ helpline. There’s a hilarious scene involving biscuits from the staffroom, and then there’s the constant pleasure of wondering exactly how Germaine is going to respond next to the mayor’s requests, the annoying man from IT and Don Thomas, a sudoku champion who now runs the golf club next door to the seniors’ building. The lost flowers of Alice Hart by Holly Ringland – this is such an amazing book and rightly deserves all the attention it received as a debut novel. Alice Hart loses both her parents in a fire at the age of nine. She’s taken to Thornfield, her grandmother’s flower farm, a long drive away and doesn’t talk for a couple of months. There’s a strong matriarchal history of her family at the farm, and she slowly understands her family and her place in it, surrounded by the care of the twelve women who are also working and healing at the farm, under the care of June, Alice’s paternal grandmother. June teaches Alice to use the language of flowers as a way to communicate the words that are too hard to share. There are many secrets and many unspoken words at Thornfield. Have a look at the video clip with the author here. This was my choice for our bookclub this year. Home fires by Kamila Shamsie – this was one of the best books I read this year. It was published in 2017, long-listed for the Man Booker Prize in 2017 and won the Women’s Prize in 2018. This book was unlike anything I’d read before because it follows the story of three British-born, Pakistani siblings who become entrenched in a political and personal situation. Told from five different viewpoints, each character has their own voice, story and motivations. It’s definitely not a light read – I read the last page with my hand over my mouth in shock! You can read a longer review here, with a video clip of the author. 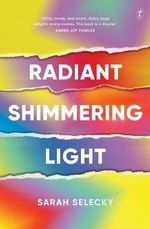 Radiant shimmering light by Sarah Selecky – A gentle satire, this novel set in Canada and the US lightly mocks the social media world where every turmeric latte is photographed in the best light and newsletters are sent out to reflect the glossy surface, rather than the banal or the debris of real life. Lillian Quick, forty-years-old, is a struggling artist who paints pet aura portraits. She connects with her long-lost cousin, Eleven, who is a gifted speaker and entrepreneur in women’s empowerment circles. All of a sudden, Lilian’s life changes – she’s earning money, she’s part of a team, she’s being supported to be her best self in her own empowerment journey. But is it real and will it last? Such a quirky, original and clever book – don’t be fooled by the supposed lightness! I could read it again. 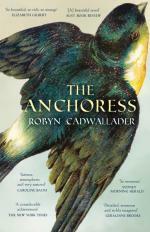 The anchoress by Robyn Cadwallader – Sarah is seventeen, living in a small village in England in 1255. After the death of her beloved sister, Sarah willingly commits to becoming an anchoress, a holy woman who encloses herself in a small room built off the side of a Catholic church for the rest of her life. Once she enters, the door is nailed shut behind her forever. I enjoyed reading this gentle and captivating story – with its relevance to the current Me Too movement. There’s a longer review here. Skylarking by Kate Mildenhall – this novel is set on the Australian coast in the 1880s, with a focus on the lighthouse and the families who live close by. It’s the story of a friendship between Kate and Harriet, two girls growing up together, without many options for friendship or love. The friendship highs and lows are contemporary, and I can see why this book is also popular with secondary school students. Although the ending is hinted at all the way through the book, I was shocked when I found out how it happened. This is a beautifully written book, which stayed with me for many days after I finished reading it. 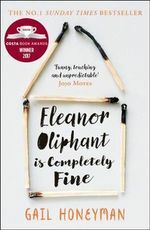 Eleanor Oliphant is completely fine by Gail Honeyman – This debut novel is written in first person from the perspective of Eleanor Oliphant. And as you can infer from the justification word ‘completely’ in the title, she’s not so fine after all. She’s a twenty-nine-year-old woman living alone in Glasgow, working as a finance clerk. Her weekdays and weekends run with monotonous certainty until she comes into contact with three men – a singer she falls in love with who doesn’t know of her existence, Sammy, an older man who has an accident in the street and Raymond, the new IT guy at work. My bookclub is discussing this one next week – I loved it so I’m looking forward to hearing what the others thought of it. Storyland by Catherine McKinnon – this was shortlisted for the 2018 Miles Franklin award. It’s the story of Australia, told through five different viewpoints at different times. We have Will, a cabin boy on a voyage with Matthew Flinders and George Bass in 1776, Hawker, an ex-convict in 1822, Lola working on a dairy farm with her brother and sister in 1900, Bel, a young girl spending her time rafting with friends in 1998 and Nada, a woman who witnesses her world collapsing in 2033. All of the stories connect – not only because of the setting but in the subtle ways the characters are linked. Each new chapter begins on the same page that the previous one ends. In fact, the last sentence of each chapter is left incomplete for the next chapter to finish. It’s such a sweeping story, so large in its premise yet the details of each individual strand hold readers captivated. ‘I wanted to write something about what it meant to be Australian,’ McKinnon says in an interview with The Sydney Morning Herald. ‘Go back a few generations and many Australians have grandparents who come from diverse cultures.’ There’s so many stories to delve into in this book. The clockmaker’s daughter by Kate Morton – I’ve heard so many good things about Kate Morton’s books and she is such a prolific writer but this is the first book of hers I’ve read. I’m only a little way through it but so far I’m enjoying the dual narrative – one told in the 1860s by the clockmaker’s daughter and one story in the present about Elodie, a London archivist who is about to marry and stumbled across an old archive box which hadn’t been stored correctly. The brown leather satchel contained inside connects both stories – I haven’t read enough to tell you how! This is a lighter read – perfect for summer. I’m also looking forward to reading Liane Moriarty’s latest novel, Nine perfect strangers, as well as Bridge of Clay from Markus Zusak. Thank you for following my blog! I’m trying to attract more blog readers, so if you have some bookish friends or family members, I’d be really grateful if you could recommend my blog by forwarding on this post. Remember to leave a book recommendation for me in the comments below to go into the draw to win Storyland by Catherine McKinnon. Many of these sound so interesting. Thank you Karen. I’m reading RULES for OLD MEN WAITING by Peter Pouncey. It’s a book that can be picked up and then left but one that makes you want to finish. I haven’t read Rules for old men, Pam – will look out for it. Thanks Karen, I have read a few on your list but will check out the others. This year I have enjoyed “Boy Swallows Universe”, “Bridge of Clay” and Jane Harper’s latest “The Lost Man” which I think is her best so far. I’m hoping Santa will give me Bridge of Clay, Terri! Hi Karen, my reading has consisted of a very mixed bag this year; I’ve worked my way through Sue Grafton’s A-Y series with Kinsey Millhone, read The Wind-Up Chronicle by Haruki Murakami and didn’t understand most of it, and I very much enjoyed Lethal White (Robert Galbraith’s latest) – I’m sure there will b a sequel to that, given the ending! I haven’t read any of those books, Wendy, so thanks for the suggestions! Hi Karen, as you know I don’t read as much as I would like but I really loved Eleanor Oliphant is completely fine. Thanks for your reviews, just looking for a Christmas holiday read now! It doesn’t matter ow much you read, Jane, as long as you’re reading! I am definitely going to check out some of your suggestions Karen. I have just finished reading The Things We Keep by Sally Hepworth. I thoroughly enjoyed the story particularly because it gives an insight into Alzheimers Disease which I am currently helping my Mother deal with. That’s great, Leane! I’ve read another Sally Hepworth book and enjoyed it, so I’ll borrow your one soon, please! I am taking all of those on board and hoping for a better year of reading in 2019 than 2018! I need more Eleanor’s in my life so I’ll give The Helpline a go! I’ve also heard good things about Holly Throsby’s new one Cedar Valley. Have a lovely reading summer, Karen! Thanks, Carolyn – I haven’t read any of Holly Throsby’s books so I will make them a priority over summer! Hi Karen. You’ve helped me settle on a couple of books I’d pencilled for ‘Santa’. Thank you! This year, I particularly enjoyed stepping back in time with Juliet Gray’s ‘Becoming Marie Antoinette’. I’m now venturing through the sequel, ‘Days of Splendour, Days of Sorrow’ and looking forward to the threequel. Ness, your books are new to me – I will hunt them down at the library!